1943 Jack was in his Senior of High School and thought he would join the service. He came to Columbus, Ohio for his exam and they asked him what he wanted and he said the Navy. Had basic training in Great Lakes, Illinois then to Green Bay, Wisconsin then off to Shoemaker, California. 1944 The Navy was building six destroyer escorts so Jack was assigned to one. After 30 days in San Diego, he sailed to Honolulu, Hawaii. Jack then went to Saipan and Guam. In Guadalcanal Jack had an encounter with a Japanese submarine. Jack’s combat station was on a 20 mm gun as the site setter. The destroyer was escorting ships to the Solomon Islands from Guam and Saipan. After that Jack went to Leyte, Philippines. 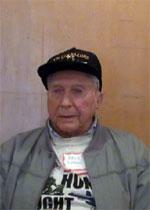 Jack went to Iwo Jima where he lost his hearing in his left ear then off to Okinawa to support the invasion fleet. Jack’s ship saw a lot of combat and he shot down quite a few Japanese planes. Jack experienced a few typhoons but he remembers distinctly the worst one where his ship was taking an admiral and the destroyer was rocking 70 degrees.